If you want to travel on the KTM Train from Singapore to Kajang in the state of Selangor in Malaysia, or vice versa, you will have to take one of the Shuttle Trains to Gemas, then connect to the new high-speed Electric Trains (ETS) from Gemas to Kajang. New Timetables for trains departing from JB Sentral. New Timetables for Trains departing Kajang and arriving at JB Sentral. 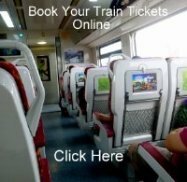 Tickets are available from any KTM Intercity station or the easiest way to book your seats on these trains is to buy them online. Tickets are available for purchase up to 30 days in advance and we suggest you book your seats or berths are far in advance as possible, as these trains do fill up quickly.